I just remembered another Freebie that I forgot to post! 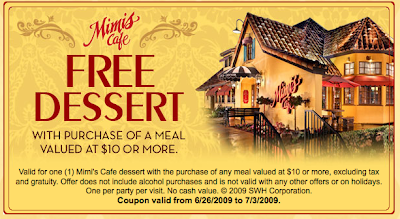 I found this coupon on the Mimi's Cafe website. We love their turkey dinner and order the kid's meal for everyone! I get full on the kids meal and my 11 yr. and 8 yr. old share one. We spend about $15 to feed our entire family and they give you the bread basket if you ask for it. I love their carrot bread. I also love their Turkey Pesto Ciabatta signature sandwich. DH and I share this one and get full. Last night we got the triple chocolate brownie for free with this coupon. It was huge and fed our whole family of 5. They do take-out and it seems to be my go-to restaurant if I am not feeling up to making dinner. It is right around the corner from our house and very convenient. Cheaper than eating at McDonalds. I've only eaten at Mimi's once. But they had an INCREDIBLE veggie sandwich that the husband and I raved about for weeks to anyone who would listen. I have an award waiting for you at my blog!